Driver’s on Lithia Pinecrest Rd. may have noticed three fire trucks parked behind the Albertson’s Plaza Blockbuster Video in the morning. Hillsborough County Fire Station No. 27 responded early today to a report of a garbage truck with its trash on fire behind the store. Waste Services, Inc, who has the contract to pick up residential and commercial trash and recyclables in Valrico, had representatives on hand after the smoldering cardboard load was offloaded by its driver as per safety protocols according to a company supervisor on site. 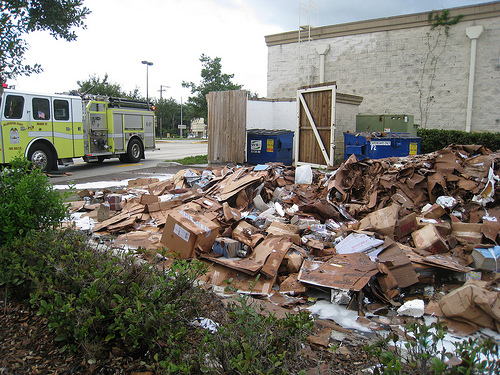 The driver, noticing smoke coming from his truck, entered the concrete parking lot and dumped its cardboard load. Hillsborough County Fire Truck No. 27 responded and promptly distinguished the fire with non-toxic fire retardant foam. After the fire was extinguished, WSI officials called for a backhoe and clean up of the site and were satisfied that the fire was an accident. For more information, contact, Hillsborough County Fire Rescue at 272-6692.